The budget agreement that emerged from last week’s negotiations literally changes the direction of federal spending. 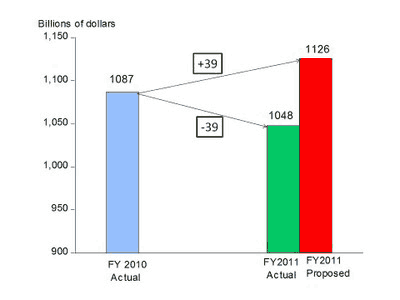 As the chart shows the Obama Administration’s proposed increase in discretionary spending for 2011 has been reversed in the course of the negotiations into an actual decrease in discretionary spending. A year ago the Administration’s budget called for an increase in discretionary spending of about $39 billion. Remarkably the agreement calls for a decrease of about the same amount. No one could have predicted such a turn around one year ago. Of course this is the first step of a longer term budget strategy. The next step is the 2012 budget and associated reforms. But this first step helps establish the credibility needed for the budget strategy to increase economic growth and encourage private investment. Note that the data in the table refer to discretionary budget authority as estimated by the CBO, excluding emergency appropriations, about which there are different scoring conventions. The totals reflect the $78 billion number emphasized by the White House and the $39 billion number emphasized by the House of Represetatives.